A classy player who quickly showed his knack for winning big possession numbers, Scotland was a valuable member of Collingwood’s 2002 and 2003 premiership teams. Although his career is more notable for his efforts at Princes Park, Scotland made an important contribution to Collingwood’s rise under Mick Malthouse. Originally from Darley, Scotland received his first chance at senior level alongside fellow debutant Rupert Betheras against West Coast in round three, 1999. He was a semi-regular throughout his first two years at the club but could only manage two games in 2001, the first and last of the year. He arguably saved his spot on the list with a 28-disposal performance against the Kangaroos at Manuka Oval in round 22 and ended the season by winning the Joseph Wren Memorial Trophy as Collingwood’s best performer with VFL affiliate Williamstown. Scotland made the jump from fringe player to senior regular in 2002, playing 19 of a possible 25 games, polling Brownlow votes in the win over Adelaide in round 14 and contributing particularly strongly mid-season. 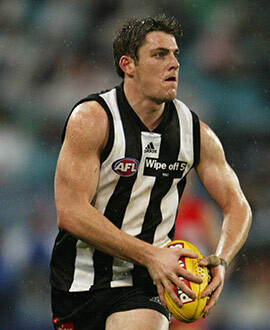 The 22-year-old was in doubt to hold his place in the team after winning just six disposals in Collingwood’s against the odds win over Port Adelaide in the Qualifying Final of 2002 but made an important contribution to the Preliminary Final win, collecting 19 disposals and kicking a vital second quarter goal. He had eight disposals in the Grand Final against the Lions but was useful when given opportunities around the ball. Strangely, Scotland fell out of favour in 2003, playing just five of the first 19 games, in three of which he was used sparingly. But as the finals approached, he found his way back into the team and took an important role in the lead in to the Grand Final. He was one of the best afield against Sydney in round 20 with three goals in wet conditions and kicked a goal amongst his 14 disposals against the Power in the Preliminary Final. He recorded another 14 touches and kicking a goal in the loss to Brisbane seven days later. In the weeks after the 2003 decider, Scotland, who had battled for regular opportunities in a midfield that contained the likes of Nathan Buckley, Scott Burns, Paul Licuria, Shane Woewodin, Shane O’Bree and Brodie Holland, was traded to Carlton in exchange for selection No. 35. His first season at Carlton could not have been better scripted, as he played every game and ran eighth in the best and fairest. He had an indifferent start to 2005 and was even dropped early in the year before regaining touch late in the season. Scotland’s next year was more consistent and he finished on a high note, as a consistent ball-winner. An honest and consistent footballer, he was still able to finish in the club’s top 10 in 2010 after his 30th birthday. He seemed to get better with age and won the club best and fairest in 2012, the year after he was an All-Australian nominee. Injury eventually got the better of him, with Scotland announcing his retirement early in 2014. Fittingly, his final game was against Collingwood in round seven.